The authorities want to arm patrollers with additional Tazer guns, which incapacitate the target with a powerful electric shock. 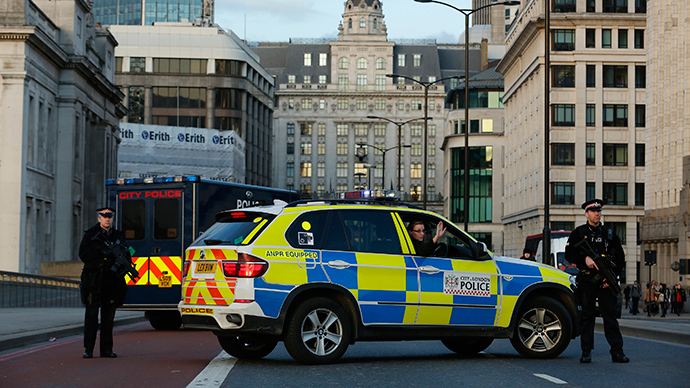 Unlike officers in continental Europe, their British colleagues mostly go unarmed. Amid the escalated terror tension in Europe, there are fears of a repetition of the knifing of soldier Lee Rigby in May 2013 in Woolwich, south London, by a jihadist loner. British police also ramped up patrol in Jewish communities due to concerns of anti-Semitic attacks. One of the attacks in Paris last week, which triggered the ongoing anti-terrorism response in Europe, targeted a kosher supermarket. Amid security sweeps, an 18-year-old woman has been arrested in Stansted airport in Essex on Friday, Scotland Yard said. She is suspected of being member of a forbidden organization and engaging in a conspiracy to commit terrorist acts. Meanwhile Belgium on Saturday began deploying soldiers to patrol the streets. Up to 300 troops may be expected in the capital Brussels and in the northern city of Anvers, which has a large Jewish population. In addition to Jewish neighborhoods the soldiers may be required to protect certain embassies, Defense Minister Steven Vandeput told in an interview with VRT network. Further deployment in Verviers, where two suspects were killed on Friday in a raid, is under consideration. It is the first time in 30 years that Belgian authorities have used the military to reinforce police in cities. The troops will cooperate with police forces until Thursday, when the national threat level will be reviewed. "It's very important to say that this wasn't a simple decision. But it was necessary, at a time when police are overly engaged, for the army to enter in a supporting role," Defense Minister Steven Vandeput told reporters. On Saturday, Greek police with the help of Europol arrested four people of Moroccan origin in Athens, Proto Tema reported. One of them is suspected of being a leader of Islamists in Belgium. An investigation is underway. According to a Belgian Exterior Ministry official, special police forces detained over 13 people in special operations on Thursday, and two additional people of Belgian origin were detained in France. Authorities raised the terrorist threat level from two to three; the highest level is four. And in Germany security forces are investigating threats to attack train station in Berlin and Dresden and the weekly anti-immigrant rallies in Dresden, according to Der Spiegel. "We are taking these threats very seriously,"an unnamed senior security source was quoted by the magazine as saying. Germany was among the nations, where massive raids on Friday in the wake of the Belgium’s thwarted attack led to arrests. Two males in their early 40s were taken into custody while there others were released after questioning. The terrorist attacks in France last week started with gunmen assaulting the offices of the Charlie Hebdo satirical magazine, targeting editors and cartoonists and police officers responding to the emergency. The deadly attack on the controversial magazine, well-known for its no-holds-barred comments on religion, politicians and society, was perceived in many countries as an outrageous attempt by radical Islamists to silence criticism and destroy freedom of speech in France. The response to the threat is controversial in itself, as for many in involved the publishing and republishing of Charlie Hebdo's cartoons, which are deemed insulting by many Muslims, as a gesture of defiance against Islamists. In some Muslim countries it sparked public outrage against secular media outlets, which ran the cartoons. French flags were burned at some anti-cartoon rallies, while in Niger a demonstration in front of a French cultural center turned violent and left four people killed in clashes.